Information governance – Nirvana or 1984? “Information governance – Nirvana or 1984?” is the title of the key note paper I will be delivering at the IRMS Conference at the Celtic Manor Resort in Wales in May this year. At the heart of Orwell’s 1984 is an information governance (IG) framework, well planned and executed to achieve its goals. IG is not a good thing in itself. It depends on what motivates it, who sets the agenda for its developmental drivers and who controls it. 1984 is a work of fiction but there are many real world examples where the power of IG has been recognised and hijacked by those in influential economic and political positions for less than altruistic purposes. Equally many well-intentioned IM and IT strategies have been developed in pursuit of an unattainable IG Nirvana –strong on principles but weak on realistic requirements and goals. It then provides some conclusions on how the IRM community can drive forward an IG agenda whose destination is neither an impossible Nirvana nor a 1984 but is holistic, realistic and achievable. Heather’s session on “The psychology of effective records and information management” was very well received at the Information and Records Management Society conference held in an almost sunny Brighton last week (May 19th – 21st). 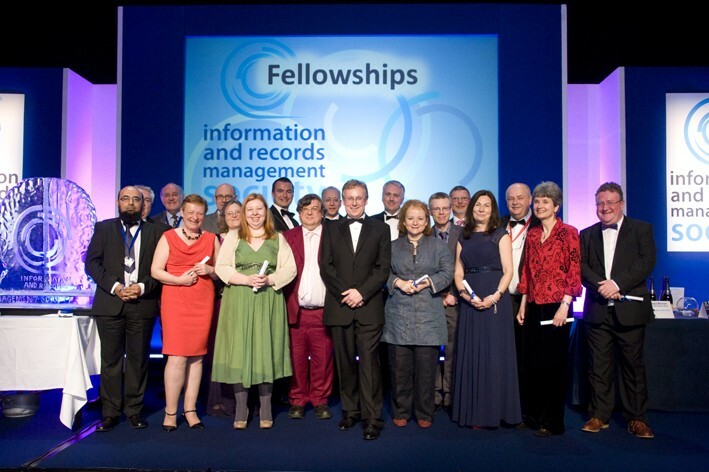 To celebrate its 30th anniversary, the Information and Records Management Society announced the first 30 IRMS Fellows at its annual conference Gala Dinner on Sunday 19th May. Heather was delighted to find herself one of the recipients and congratulates her fellow Fellows! May 15, 2015 » Information governance – Nirvana or 1984?